A bit of a different finish this week but I thought it was a fun one! I made this wreath for my DOTD loving sister who had a birthday recently and I loved how it turned out. The other fun part? I'm going to be teaching this wreath as a class at Fabricate Atlanta in October. If you're local I'd love to see you there. Find all the details and registration info on Fabricate Atlanta's website. Of course now I need to make another one for myself and then maybe one for Thanksgiving too! Hope everyone here in the States has a good Labor Day Weekend - see you back here next week for more quilty fun! Can you believe it? That pile of fabric last week actually turned into this! The miracle of it really is that we had two family birthdays last week also, which meant millions of cupcakes and cleaning for a party here on Saturday. Fun but busy. Even with all the busy-ness I was so excited to get this made. I think they turned out beautifully and I LOVE all the new AMH Hand Drawn Garden prints. This was a great block to show them off, especially the large scale prints. And yes, I clearly have a favorite. Now to get it quilted - I asked for quilting advice on Instagram and got some great ideas, happy to hear any more if you have a good one! Now on to the next version of this quilt with these fabrics - we were going for Americana, country and vintage as the feel for this one...what do you think? Prints for the stars, solids for the frames and the pearl bracelet for the large outer border. Denim for the back and a pop of red binding will make one sweet baby boy quilt (I think anyway). Happy Wednesday everyone! This week I'm working on a baby quilt for a friend and it's a new pattern that I found on Craftsy - I wanted something more than just patchwork and I think this will work beautifully. Since I haven't made this pattern before I wanted to do a "practice" one before I cut into the only fabric I have for the baby quilt. In an effort to "not let the fabric be too precious" as my wise friend says, I am boldly cutting into my AMH Hand Drawn Garden. Normally I would save this on the shelf waiting for that just right project but I felt inspired to USE it and ENJOY it. I'm going to use the Loulouthi for the border around the stars and maybe a different Hand Drawn Garden print for the outer border. I'm excited about this project! Life's too short to leave all that fabric on the shelf, right? Welcome to my craft room! 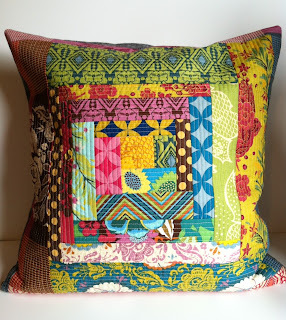 I've been following all the crafty/sewing spaces over at Ellison Lane and the Sewing Loft this past week and it was so much fun I decided to play along. I am incredibly lucky to have an entire room in our house to use for my sewing with enough space for the kiddo to play and hang out too. It also has a huge closet that I've managed to stuff full! Loads of bookcases and comfy places to sit. Wall art by Rachel Hauser at Stitched In Color and Amiee Dolch at Artsyville. Farm table big enough to hold my sewing machine and cutting board. Also room for my helper to sit and "work" alongside me when she feels the urge. IKEA metal shelves hold fabric scraps on my side and paper/craft supplies on the kid's side. My inspiration and work corner. Burlap covered cork board was a Pinterest project. Carved parakeet from a local folk artist. Artwork from Pen & Paint, Ian Nicholas, Melissa A. Robinson and Jennifer Judd-McGee. Etsy prints and IKEA frames make me really happy! It may look cluttered but to me it's colorful and cozy and I have everything within reach. Happiness. Mini quilts by Victoria Gertenbach at Silly BooDilly. Vintage Fisher Price girl with sewing machine and enamel ware bowl from Etsy. We also have a futon in here for lounging or sleepover guests. Both Chicopee quilts and pillow made by yours truly! Finally, one last treasure from Melissa Crowe at Checkout Girl. Thanks for stopping by my little corner of the world and happy sewing! Linking up over at Ellison Lane. Happy Friday people! We made it! Can you tell it's been a long week? 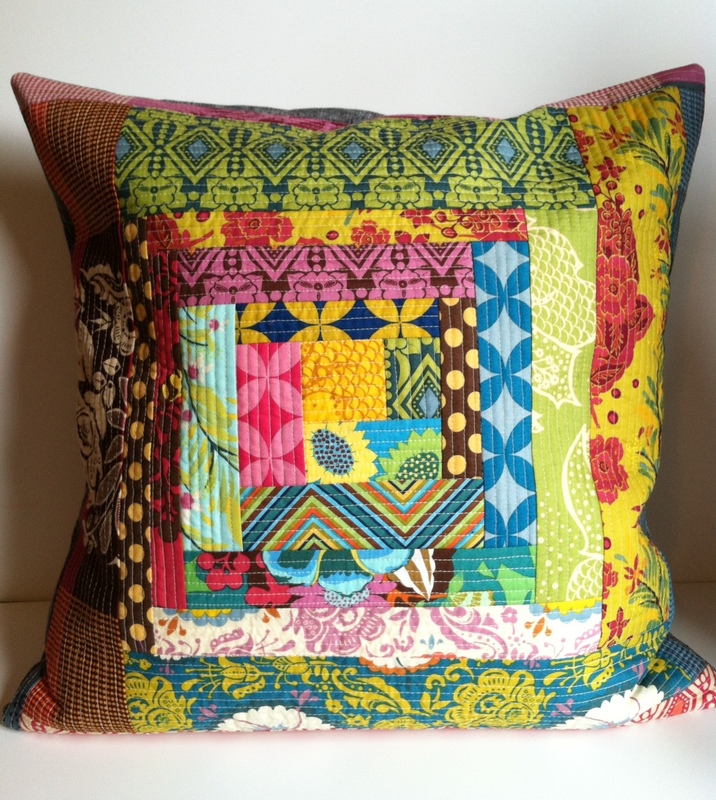 So last night was our West Atlanta Modern Quilt Guild pillow swap and here's my pillow. I gauge how successful my swap projects are by how much I want to keep them and this was a raging success! As hard as it was to part with I knew these girls would bring their A games so I wanted to make something good. Plus it was really fun to see someone love it as much as I did. Simple black yarn-dyed Essex linen envelope closure for the back. A bunch of Anna Maria Horner scraps put to good use on the front. These seriously started as a pile if scraps that I absolutely loved but had no idea what I'd use for. I used the quilt-as-you-go method and it was awesome - easy to start and stop as time allowed. Plus I loved the texture that the dense quilting gives. I'm now eyeing the remainder of the scraps for another pillow for myself! Thanks to everyone who left a comment on the bag giveaway from Monday - the winner is Rebeckah who blogs at Handmade by Rebeckah, I'll be emailing you shortly for your address. 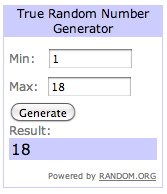 How about a little give away to get the week started? I was thinking about a bag I'd like to make and looking through my patterns for something similar and I realized I have duplicates of these four! I'm sure someone (besides me) needs more bag patterns right? So I thought it would be fun to share them. I'm happy to mail anywhere so giveaway is open to all and I'll keep it open through Thursday night and announce the winner Friday morning. Make sure you leave me an email if you're a no-reply blogger. Here's hoping our Monday isn't too painful! 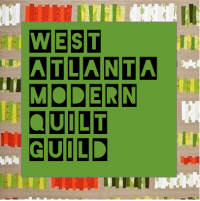 This week I'm working on a pillow cover for the West Atlanta Modern Quilt Guild Swap which is next Thursday. Any size pillow cover, any fabric, any technique - if you're local you should think about coming. We have a fun and talented group getting together! So I had this pile of AMH scraps that I was saving for the "right" project and I thought this would be perfect. I'm making a quilt-as-you-go pillow and it's a technique I've never tried before. So far, so good! But I think I should give Anna Maria most of the credit, I mean can you go wrong putting all her gorgeous fabrics together? I think not. I can't wait to see all the fantastic pillow covers that I know these girls will bring - I'll have a full reveal of how my pillow turned out next week, after the swap. We're also doing a challenge with Blend Fabrics Hip Hop Holiday line, fabric given out next week to all who want to participate. We're so lucky to have Blend as a hometown fabric company and we're excited to work with them! You can find the WAMQG blog and meeting info here. Also I'm participating in Ali's Stash Match this month - so many beautiful stash stacks over there, go look at ASquaredW! If you're wondering which stack is mine all you need to do is look at the fabrics I used today as one giant hint :-) There's a giveaway involved - Good luck! The may look like humble, unassuming chocolate chip cookies but they are sooo much more. Even the world's pickiest eater has declared them yummy. I could go on and on and ON about them but why don't you just go make some? I promise you'll thank me later. Chill dough in the fridge for 10-15 minutes while you preheat the stove to 375 degrees. I baked cookies on my silpat lined baking sheets, original recipe called for ungreased baking sheets but I didn't want to risk it. I also use a small scoop to get all the cookies to be the same size. Bake for 10-12 minutes - cookies should be golden brown on the edges but still soft on the top. Let cool 5 minutes on the cookie sheets before moving to a rack to cool completely. Happy Friday! A fun finish to share today - my Super Tote! This is Anna from Noodlehead's fabulous pattern, which you can get as a download or now a printed pattern. I used some of my precious, favorite Anna Maria Horner fabric to make the front and back panels. This is a great way to showcase a little bit of fabric for a big impact! Some of these strips were leftovers from a jelly roll and then I added a few more 2.5" strips to get enough and then just cut the pattern piece from my pieced panel. I used bias tape (that wasn't cut on the bias at all) made from black yarn-dyed Essex linen to finish the top of my pocket. Also I fully lined the pocket. Black yarn-dyed Essex linen for the exterior gussets and straps made me really happy. Basically I could sew everything from Essex linen. Interior with a solid Kona and another AMH print for the pockets. I divided one pocket into halves and the other side into thirds - made better sized pockets for small things like phone and keys! I used Pellon fusible fleece on the exterior pieces and a fusible mid-weight interfacing on the interior pieces. Next time I'd use Shapeflex on the interior pieces as the mid-weight interfacing was a little papery for my liking. This pattern seemed a little daunting to me until I jumped in and started working through it and then it's such a well written and photographed pattern that it made complete sense. If you've been feeling intimidated I'm here to tell you YOU CAN DO IT :-) Seriously. It's a great sized bag, as my assistant so happily demonstrates. Nutter. I'm linking up with Crazy Mom Quilts for Finish It Up Friday.